The non-representation of girls from the GTC at the recent OECS junior tournament in St Lucia, was a glaring reality. âDefinitely we have to try to get more girls on court, since all the other teams that were in the tournament were able to enter girl teams,â head of the GTC Grant Connell told SEARCHLIGHT. âThis we intend to do in October when we tap into the Police Youth Arm when post-graduation of the officers who complete the tennis course at GTC, later this month,â Connell projected. 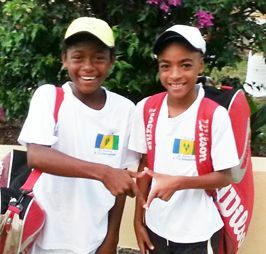 At the OECS tournament, GTC was represented by the male pair of Antonio Cain and Akeil De Roche. Cain and De Roche, who were initially placed in Group B, defeated Suriname but lost to Jamaica. Because of rain, organisers were forced to re-adjust the tournamentâs format, as the duo were then placed in play-offs to determine fifth to eighth positions. Cain and De Roche defeated St Lucia team two, but lost to St Lucia team one, thus securing the sixth place. Trailing the Vincentians were Trinidad and Tobago, Antigua and Barbuda, Suriname, Grenada and Barbados. Connell thanked those individuals who made it possible for the GTC contingent, which also included manager/coach Khir Huggins to travel to St Lucia. âI would like to thank our sponsors Mustique Company Ltd, SVG General Services and the Mustique Tennis Club, in particular Stephen Joachim, Leroy âFlyâ Edwards and Richard Schaffer for their kind assistanceâ¦ They understand the need for youths to compete regionally, not just competing locallyâ¦They all understand sport and the role it plays in the development of the youth,â Connell said.